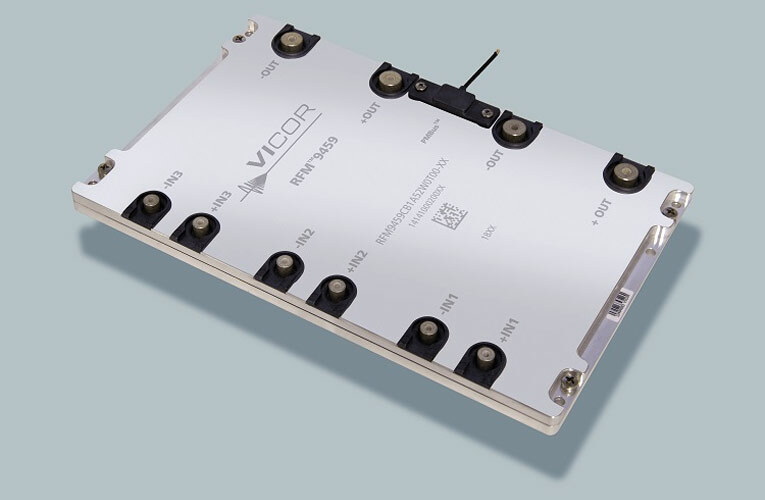 Vicor Corporation announced a new 3-phase, AC-DC converter module (“RFM”), capable of delivering 10kW of regulated 48VDC in a power tablet configuration measuring 9.4 x 5.9 x 0.6in (24 x 15 x 1.5cm). The RFM™ provides a power-factor-corrected, regulated, and isolated DC output with integrated filtering and built-in fault protection for redundant operation. The RFM can be configured to accept worldwide 3-phase AC mains from 200 to 480VAC. The low-profile power tablet design of the RFM enables unprecedented power density and thermal management flexibility. For example, four RFMs in parallel, including input-disconnect circuitry, rectification and hold-up energy storage at 48V, can supply 40kW of power within 1U of rack space. The RFM power tablet package provides adept thermal management for advanced cooling, including liquid cooling, of high-power server racks for demanding HPC and AI inference and learning applications. 48V (including 54VDC) distribution is the emerging standard in high-power racks utilizing smaller-gauge wiring, and achieving substantially lower distribution losses, than legacy 12VDC distribution. In combination with Vicor 48V Power-on-Package (“PoP”) and 48V Direct-to-PoL solutions, the RFM enables dense and efficient end-to-end power system solutions, from 3-phase AC to sub-1V AI processors at the point-of-load.